A long time ago, in a village far, far away, some disturbed townsfolk decided to destroy their entire town in order to rid themselves of an evil menace (it's technically a dog-mouse, but I think it's an idiomatic thing). Anyway, so the villagers rebuilt all the buildings in the town (including their precious outhouses), but forgot to include city walls, a river, or roads. To rectify this, players lay tiles with one of these three things onto the board, and any building caught underneath them is automatically eliminated, except for outhouses. When an outhouse would be destroyed, players take a vote on whether to place that particular section. Each player is trying to retain the most of one type of building, and once all the pieces have been placed the winner is the person with the highest valued buildings still standing. Fans of Klaus Teuber will be interested in this remake/redesign of Drunter und Drüber, a 1991 Spiel des Jahres winner. Just south of nowhere, there's the junction of the Mayfair & Rossdorf RR and the Turvy Trunk Line. Springing up from the desert like a tumbleweed lies the eccentric little town of Rossdorf. Like most western towns, Rossdorf has a Land Agent: Guy Dough, the brother of that wicked varmint Black Benny. A shrewd opportunist, Guy's done sold all the town land ('ceptin' the outhouses) four times over! Every acre in town that ain't got an outhouse on it is owned by the miners, the railroads, AND the fort captain. Just about a year ago, miners digging in the shadow of Fort Rossdorf struck the mother lode! But it wasn't gold, and it wasn't silver. No, my friend, it was just a little spring. Not any ordinary spring, though! It was a torrent of that mind-marbling drink the locals call "Wacky Water!" 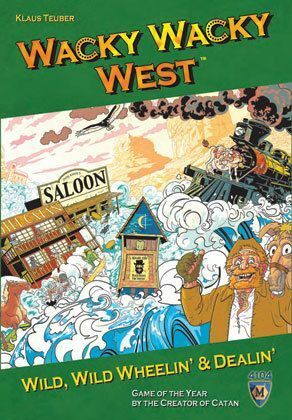 In Wacky Wacky West you and your fellow townfolk place track tiles, street tiles, and river tiles hoping to destroy your rivals' buildings. Every time someone tries to build over a precious outhouse, the town votes! You try to enlist your supporters (represented by cards) to vote with you to stop or encourage the play of certain tiles-perhaps saving some of your buildings or taking out those of your dastardly opponents.